Filed to: Is it a Chrombook or is it a tablet?Filed to: Is it a Chrombook or is it a tablet? Is it a Chrombook or is it a tablet? What started out as a super lightweight OS for low-powered laptops, Chrome OS has expanded to run on desktops, pricey 2-in-1s, and even mini PCs, while also adding support for most of your favorite Android apps. But now, it seems Chrome OS is headed to the classroom, in tablet form only, with the oddly named Chromebook Tab 10. 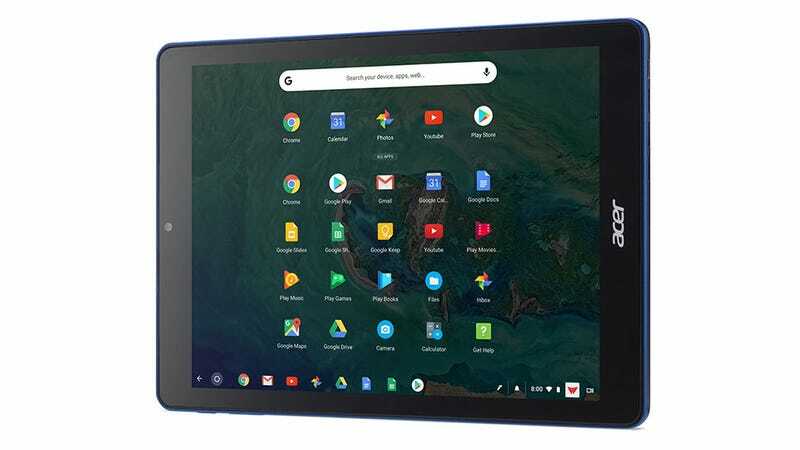 The $329 device, which Acer styles as the first Chrome OS tablet for education, is a pretty straightforward gadget. It features a 9.7-inch 20148 x 1536 touchscreen, an ARM-based Rockchip processor optimized for Chrome OS, 4GB of RAM and 32GB of storage, with microSD card support if students need additional space. The Chromebook Tab 10 even has Wacom EMR active pen support and an included stylus that can be stashed inside the tablet’s built-in dock on bottom. Like most tablets running Google’s other OS, the Chromebook Tab 10 (which should really just be called the Chrometab) comes with full support for the Google Play store, so there shouldn’t be any shortage of compatible apps. And with the easy IT management Chrome OS’s education license offers, it should be easy to keep students away from unapproved games and focuses on their work too. But what you won’t get is a keyboard, which seems weird for something with the word Chromebook in it’s name. Presumably, there’s nothing stopping you from hooking up a wired keyboard using the tablet’s USB Type-C 3.1 port on bottom, or doing it wirelessly over Bluetooth. However, this choice does add credence to the feeling that sooner or later, Chrome OS is going to take over for Android in the tablet space. This is a transition we’ve watched happen slowly, as Google continues to added features to ChromeOS that blur the lines of what started out as a very minimalist desktop OS. But what might be even more interesting about the Chromebook Tab 10 is seeing how it fits into Google’s (and Acer’s) attempt to control the classroom with low-cost devices, and how their lineup will look after Apple hosts its own education-focused event in Chicago tomorrow. What (and Why) Is Google&apos;s Chromebox?